Ever since Dead Of Night's inaugural album 'The Dead Shall Rise' (2014) and its sister-album 'The Dead Shall Rise Again' (2015) arrived, this north west of England band have been maturing as an outfit, and going from strength to strength with their musicianship. In 2016 came 'In Search Of Ancient Magic' which sent a clear message out to any doubters; this band meant business and were in it for the long haul. Expertly guided along by keyboard impresario/producer Carl Eden, Dead Of Night must now be taken very seriously. They may still be some way short of their illustrious peers, such as Within Temptation, Nightwish and Delain et al., especially regarding fan base, but they now have them clearly in their Symphonic sights. 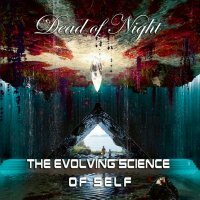 The band's progression is irrefutably clear as 'The Evolving Science Of Self' is, by far, their best contribution to date. The opening salvo of 'Here Come The Metal Men' and 'Seraphim' produce, in my opinion, the absolute best we've witnessed from the band hitherto. Eden's swirling keyboard expertise and tasteful gimmickry are once again front-and-centre, with the vivacious rhythm section of Dan Roberts (rhythm guitar), Jason Peacock (bass) and Mark Commons (drums) providing a powerful undercurrent of effervescent melody; guest guitarist Sam Rutter adds impressive embellishments when required. However, as with most Symphonic Metal ensembles, it's the lead vocals that tend to sparkle and shine incandescently, and with Briony Featon they have a diamond that is no longer rough around the edges, but one who is now highly polished and who gleams radiantly throughout. Eden told me recently that he "... likes to think of Dead of Night as a Symphonic Metal band for people who don't like Symphonic Metal and thinks this album takes them even further away from the genre." Personally, I think the band have encapsulated an idyllic equilibrium and layered it with a British sheen, as 'One For The Moon', 'Someone's Calling You', 'Home' and 'When The Nightingale Sings' clearly exhibit. 'For I Am Music', 'The Six Steps' and 'Invasion' begin to reveal a welcomed Progressive edge to their armoury, and of course, we mustn't forget the obligatory ballads in the shape of the sublime 'Set The Night On Fire' and 'I Will'. 'Onward' concludes the opus in typical Dead of Night exhilarating fashion.